The Inside the Hall Mailbag is a collection of questions tweeted to us via Twitter (@insidethehall) and sent to us via our Facebook page. Submit your questions and we’ll answer as many as we can. @JSutel writes: Yogi has improved all season, what’s the next part of his game to come, consistent finishing at the rim or that jump shot? As you said, I think we’ve seen Yogi Ferrell improve in just about every area of his game as the season has progressed. But after a glance at the numbers, I think he’s been adequate in finishing at the rim and with his jumper this season. In terms of finishing at the rim, he’s taking 25 percent of his field goal attempts at the rim and is making 64 percent. For a small guard, that’s a good enough percentage. As far as the jump shot goes, his overall percentages are not great, but he’s shooting close to 36 percent on threes in conference play, which is an improvement over the 20 percent mark posted in non-conference play. That tells me he’s becoming more comfortable and confident. I think the next part of his game to come to elevate him into the elite level of point guards in college basketball is to cut down on his turnovers. His turnover percentage (23.8) is the highest among IU starters. Some of that has to do with the pace and style of play the Hoosiers play, but there are also instances where he goes airborne with nowhere to go or tries to make a pass that isn’t there. Some of that is just how he plays, but I also feel like some of it is still a matter of making an adjustment to the college game. 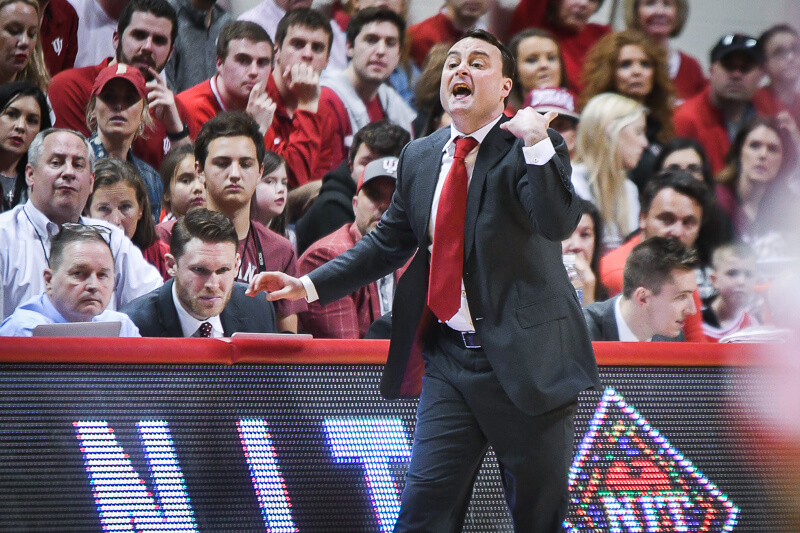 Nathan Curtis-Wagoner writes: What are the chances IU will end up in the Midwest region of the NCAA bracket? Very good right now, but there’s still a lot to play out. Michigan losing last night at Penn State certainly helped the Hoosiers because the Wolverines are likely eliminated from contention for a No. 1 seed. The Wolverines probably had an outside shot of making a play for the Midwest No.1 before last night, but losing to the Big Ten’s worst team ended that. A team to keep an eye on is Louisville, which is strong in the computers and has won 7 of 8. 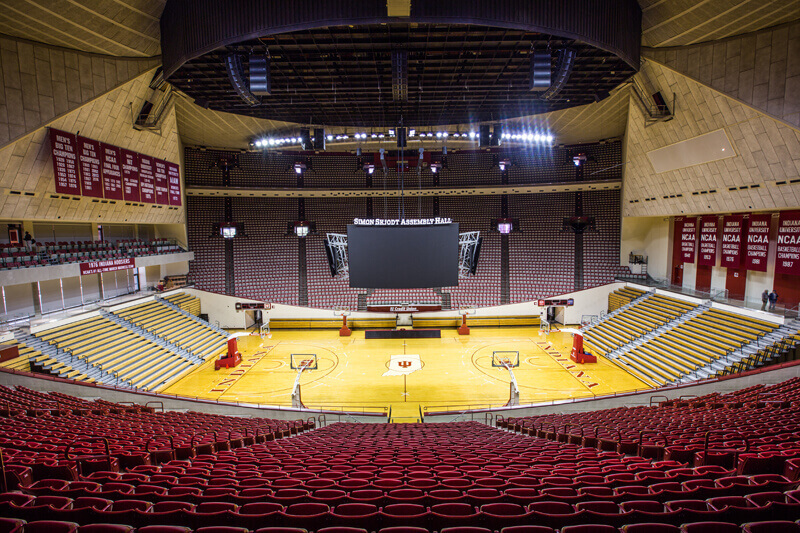 Ultimately, Indiana just needs to win games to play through Indianapolis. I believe an outright Big Ten regular season championship makes the Hoosiers a lock for the Midwest No. 1 and if they share the title, they’ll probably have some work to do in Chicago to button things up. I’d characterize the chances as very good at this point, but nothing is guaranteed yet. @funkmastacrab writes: What’s with Remy? He started the season off strong, but he hasn’t been the same since…is confidence a factor? Tom Crean said earlier in the season that Remy Abell doesn’t realize how good he is or can be and his play in recent weeks seems to suggest that confidence is factoring in. 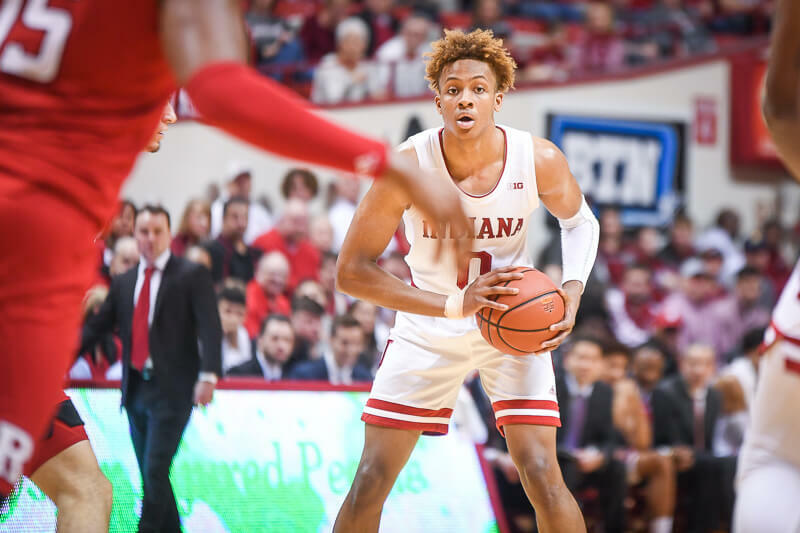 Late last season, Abell seemed to be playing without fear when he had to step in for Verdell Jones in IU’s win at Purdue. He continued to play well in the Big Ten Tournament and NCAA Tournament after Jones went down with a season-ending injury. His sophomore season started off very well as he was shooting the ball without hesitation from the perimeter and playing solid defense. That type of production has been missing since the start of Big Ten play and the shooting numbers for Abell aren’t pretty in league play: His field goal percentage is 35.7 percent and he’s just 2-of-8 on 3-pointers. It’s been a while since he’s spoken to the media, so it’s tough to pinpoint exactly what isn’t working from his perspective. His minutes have fallen to under ten per game in the Big Ten. Right now, it’s hard to imagine him being much of a factor the rest of the way unless things changes quickly. John Cole writes: If Cody comes back next year, who do you for see being in the front court with him. If he doesn’t return, who do you see in the front court? If he comes back, I’d say you’ll see him with Noah Vonleh in the front court. Vonleh said after his commitment that he’s been told he could assume the role Christian Watford is vacating and given his immense talent, it’s hard to imagine him as anything less than a starter from day one. If Zeller leaves, the situation isn’t quite as clear. Vonleh’s role probably wouldn’t change and Zeller’s minutes would probably be split between Luke Fischer and Hanner Mosquera-Perea, depending on how he progresses in the offseason. @hoopstrainer writes: Is Cody’s lack of touches throughout a game more a Cody issue not being demanding or Cody being on a team with many options? I haven’t charted to see how many touches Cody is getting a game or do I have data that compares the touches he’s getting compared to other big men across the country, but I’m not sure he’s getting a “lack of touches.” I think when IU loses a game, the natural inclination is to rush to look at what exactly went wrong and then assign blame. IU has the best offense in the nation’s toughest conference so I don’t think there’s any basis to criticize how the offense is being run. If you look specifically at the Minnesota game, it was pretty clear that going inside wasn’t working too well. Trevor Mbakwe and Rodney Williams blocked a couple of Zeller’s shots early and I think that made him a bit tentative. I do think he could try to post up and call for the ball a little bit more at times like he did in the wins at Michigan State and Ohio State. But when you’ve got other efficient options like Jordan Hulls, Christian Watford, Victor Oladipo and even Will Sheehey off the bench, the ball has to move around and find the open man rather than being force fed into the post. HAHAHAHAHA! I meant Blackmon, obviously. I was really busy at work today, so I had that message open for over an hour. Not my finest post! Oops. It would seem that way today, wouldn’t it! facepalm. I’m with you on that. I think Hanner will be a great deal better next year. The guy is so athletic. Crean used to ‘rave’ about him.. was quoted as saying at the beginning of the year. ‘If I could name a starting seven, Hanner’d be on it’.. But then he and Peter had to sit those nine games..and he seemed to get behind all the others, when he missed out on all of that game experience. I think playing in those games against the weaker competition, he could’ve been a whole lot more effective when B1G season started. As it is, I can understand Crean’s hesitancy to put him in now, in critical situations in crucial games when trying to win the B1G Championship. I do think he has the talent though..to be a very good contributor next year, with an off-season of work and then fall practice. Yogi needs to develop an effective floater. He used a shot fake twice and drew a foul both times and made both free throws each time. You know me, the why don’t they use a shot fake more often fanatic, wouldn’t miss one nor forget the number of times they used it. After Mbwake ” blocked ” his shot you know he was just salivating to swat another one and was going to immediately jump at the first sign of anything that even resembled the start of a shot. Believe one of the fouls he drew using a shot fake was on Mbwake. The media is being a little unfair to Cody, and as a result, I’ve noticed a lot of IU fans starting to buy in to the “he’s just not ready” argument. If you say a guy is the pre-season best player in the country, he only has to end up as the second best player, and he’s failed to meet expectations…..I’m not saying he is even the 2nd best player this year, but he is up in points, blocks, rebounds, down in fouls, and is playing the same 28 minutes a game he did last year. Dakich told Jay Williams on his show the other day, he’d rather have Plumlee than Zeller….. I think that is an absolute joke. If Cody Zeller comes back for his Junior year, yeah, it would be awesome for us fans, but he is the best big man in college, would own Olynyk, Noel, and Whithey head to head… You think out of the 14 lottery teams, none of them need a Center? Because, only one of them has to, and Zeller is gone. Even if you think Zeller and Plumlee are even, if you’re the GM, who are you taking, the guy who took 4 years to get there, or the guy who took 2? The same Meyers Leonard that was jammin on the Denver Nuggets front line last night, was embarassed by Cody just last year. The center position in the NBA is at a historically poor level. New Jersey gave Lopez like a billion dollars to be their franchise center…..anyone think after 2 NBA seasons, Cody won’t be posting similiar numbers? Sorry, but if Cody came back, it wouldn’t be because he “isn’t ready”…bc that would imply he wouldn’t be a top 10 pick….he will be. In all honesty, I feel more comfortable with Watford Inside than Cody. Just think he has developed more of a post game….however I do think Cody needs to touch it every time down. Didn’t do a very good job of typing what I was thinking. Was thinking that if CZ returned that, at first anyway, JH may be at the 4 and that rather than put another 4 at the 3 Crean would likely go with someone with a little more foot speed and maybe somewhat of a better handle especially with the way Crean likes to have just about anyone grab the defensive rebound and immediately start pushing the ball up the court themselves or have someone trail the break for a 3. If he wouldn’t be giving up a whole lot in rebounding and on the defensive part I could see this being very possible. Like you, just MO. See my reply to HoosierKen73 above. I know the general rule on here is to not speculate who will and who won’t be here next year if they still have eligibility left but I really wonder if that 6th spot won’t be Creek deciding to call it a career and move on since he now has a family. Then again you never know he may figure that he has finally went a good stretch without another injury, feels like he is continuing to recover and make progress and another year will enable him to have a chance at making some money overseas. Couldn’t blame him if he did I’m sure making some real money playing bball has been his lifelong dream and if another year enables him to do that then good for him and he deserves to have that opportunity afforded to him. As always it will be interesting, to say the least, to see how it all plays out. Poorly typed thoughts. My thinking was that if CZ returns, at first anyway, JH would be starting at the 4 and rather than start another 4 at the 3 Crean, with the style he prefers to play, would start someone with maybe a little bit more foot speed and little bit better handle at that time and still not lose that much, if any, in the rebounding and defense department. News flash………..CZ is NOT the best C or PF in the country. He is talented, but to be considered the best, one cannot fold like a deer on ice when facing a tough defender. CZ has the talent to be the best yet lacks an interior game and set of moves to be dominant. He rarely gets and And 1 at 7′ tall. I kind of agree with a piece of your point I guess. I do not think having Watford post up and backing his man down is a good idea like you seem to be saying, but I do think he needs to be put into more isolation situations where he can beat his man off the dribble. There aren’t many 4’s in the country that can stay in front of him when he puts the ball on the floor. It gives him the opportunity to shoot a little pull up or go in hard for a layup. He doesn’t seem to be able to elevate enough to get his shot off like he wants to from a pure post move. Jordy’s shot isn’t textbook, but after hearing the explanation I think it should be. His father coached him to shoot that way to keep both eyes clear to see the basket. I always thought it seemed kind of stupid to use “correct” form because, in doing so, you’re bringing the ball directly in front of your eye. He needs two things. More frequent use of the shot fake is one and going straight up is the other. OK, make it three things, because he has to quit shooting from his chin. That’s not a bad idea if for no other reason than the extremely limited number of guys who’d be guarding Cody at the top of the key who can stay in front of him. Even though he missed the first nine games he still got to practice (against some of the best competition in the country, no less,) so I think he just wasn’t nearly as ready for prime time as we all expected him to be. In hindsight, he and Jurkin could probably both have benefited from a redshirt year, but then they’d have still had to sit out the first nine games of next year. Will’s gonna be whippin’ this horse next year. As the only senior, he’s going to be the absolute leader of this bunch. Yogi, Hollowell, Sheehey, and Vonleh will be the top four scorers of the bunch. I thought about that after I typed this, but I had to drag myself back to work. I do think Marlin’s probably going to be the best pure shooter on the roster–don’t know if that will translate to minutes, but he could play a Matt Roth role. If you hit “post” an “edit” option will come up. I’ve used it many times to correct typos. I think he plays fantastic one on one defense. His chest is always squared up with his man and he fights hard through picks. He gets called for one or two BS fouls per game where the offensive player initiates the contact while Yogi is in a spot that he is entitled to be in. As you say, Craft gets those calls. Yogi will get them. 36 percent on 3s is good on most teams. I’ll always remember Kyle Hornsby saying 35 on 3s is worth as much as 50 on twos. He was right. Re: the Hulls comment, I’ll just say this: Hulls has the extreme benefit of being allowed to play as a 6’0 shooting guard. Very few programs can pull that off successfully and remain as the #1 team in the nation. In fact, I’m not sure he’d get the same looks. It’s not like Kellen Dunham is lighting the place on fire. Let’s be real, how many teams have two POY contenders, a stretch 4 who shoots 50% from 3 and a lightning quick, pass-first PG who penetrates consistently for open looks? No way Cody comes back. He is a top ten draft pick. No way his stock goes up if he stays; it can only go down. I’m all for players staying, but if they are smart, they will go pro the year they get the most hype. That is this year for CZ. Watford has a better post game than Cody Zeller, is the reason I want Watford to work in the post. Cody has a tough time scoring on the block against guys his size and guys who are stronger. With no consistent post move he struggles. Watford has a very good jump hook he uses and to me has been more effective in the post than CZ. Olynyk, Plumlee are more polished in the paint. Withey also blocks 4 shots a game. CZ is lucky to get 1 these days. He seems to be late way to often on helpside D to be a shot blocker. He barely alters shots yet physical defenders alter his every time he tries to get to the basket. I like that he is developing a fadeaway j in the lane, but would love to see something different than trying to out quick or bull rush his way to the rim. He doesn’t pump fake well, shot fake and step under or across well, or have a combo move when working on the blocks. Simple moves like that would draw more double teams and then he could pass to the open wing. If you notice teams do not double team him much this year because we have so many weapons. However, Cody is producing about the same as last year. Better moves in paint and he would score 20 ppg. Two things Izzo said after his disappointing home loss to IU. Our scouting report made 2 things clear: 1) cut out Oladipo (keep a body on him all over the court to keep him out of plays) 2) Watford ALWAYS drives to the right..yet we didn’t give help) When the competition knows where you are going..(Wat) it;s hard to get there . I’ll take Zeller in the post any day for any shot..even though he needs to use his face the basket game more often. I agree with you, he got the practice. But there’s nothing quite like getting into the game..the crowd, the intensity, etc. It’s quite a bit different than playing against guys you see every day, most of them pretty close friends, guys whom you know their moves, they know your’s… But I do get your point. I really also thought he would be much more ready, with all that athleticism, for prime time appearances than he has been.. So… point well taken. Since he does so many other things really well one hates to nitpick & point out things that they think he should do differently or better but it does seem like he doesn’t use his height & wing span to his full advantage at times. I have my ideas on who are the possibilities too. So far as Mo is concerned, like you, I’d love to see him come back, especially considering that I perceive next year’s weakness to be outside shooting. He could fill a Matt Roth role for us next year – 10 mpg, senior leadership and rain 3s. We could definitely use him. But, also like you, I can see him choosing not to play again, because it has to be hard enough to be a student-athlete, but raising a child at the same time has to be brutal. I have a hard enough time raising my kids, and I am (slightly) older than Mo! Do you know if he graduates this year? If he does, while he still would have a year of eligibility remaining, he still must be enrolled at the school in graduate courses, I believe. It sounds corny, but over the years you start to grow attached to the players, and you hate to see any of them leave early. Whomever is the 6th person is someone that our program will miss. 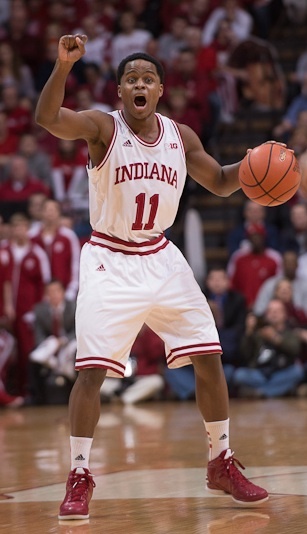 any chance Darius Latham plays BBall at IU? Agree but how about a reliable pull up a jumper and 3 pt shot first. I don’t see how Yogi has improved and also thinks he hurts the offense at times. He can’t shoot the ball, dribbles to much, and can’t take his defender off the dribble. This is a good case of a player coming from 2A ball and being over rated. I think Hanner and PJ are kids who probably should have a ball in their hands at all times. I’d seriously consider that if I were coaching them—don’t care what we’re doing, be it wind sprints, etc. you’ll be dribbling as you do it.If you aren’t on the floor scrimmaging or doing drills you’ll be catching balls. I’m sure one exists for basketball somewhere, ,but they could both benefit from a Jugs type of machine they use to shoot out footballs for passing/punt return drills. Some of it is a result of footwork, too. He gets his body extended parallel instead of vertical at times and it makes it easy to knock him off balance.